Explore Azore® with Sabalcore’s HPC Cloud Service. Azore® in the Cloud is available on-demand now. Start today with a free demo account. available now on-demand. Import mesh from ANSYS® Fluent. Pay-per-use pricing for license and processing. and distributed by Azore Software, LLC. 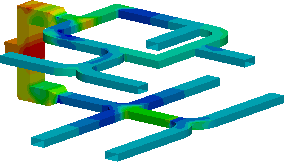 This tool uses the latest numerical methods to virtually simulate the behavior of fluid systems on a computer. It can be used for engineering analysis of complex flow systems. Sabalcore HPC Cloud su pports the Azore® CFD Software Suite. Sabalcore users can run Azore® in the cloud. Azore® utilizes the control volume method for discretization of the mesh topology. Traditional mesh topologies as well as arbitrary polyhedral mesh topologies are acceptable inputs for this numerical analysis tool. FLUENT® (binary/ASCII) case files. Note many of the case features are also imported such as boundary conditions material properties. Further technical details about the Azore solver can be found at www.azorecfd.com. Access Azore® on-demand. Processing and Licensing is included in one price. Sabalcore has the latest versions of Azore® pre-installed and ready to go. It has been optimized for the Sabalcore HPC environment so you get the best performance. Work from command-line (batch mode) or graphically. Use the native Azore® GUI. Complete this short form. You will be provided with one user account, storage, and free core-hours to get you started. Or Contact us to discuss how Sabalcore’s HPC services and solutions can help your company. The Azore name is a trademark of Azore Software, LLC. Fluent is a trademark name of ANSYS. Trelis® is a trademark of csimsoft.